Kapil Sharma ties knot with Ginni Chatrath: The famous comedian Kapil Sharma has finally tied the knot with longtime girlfriend Ginni Chatrath in Phagwara, Jalandhar on Wednesday, December 12. Kapil Sharma wedding has happened in traditional Punjabi style. Sharma shared his wedding pictures on his social media, Instagram. On this same day, there was another big wedding that of Isha Ambani and Anand Piramal. 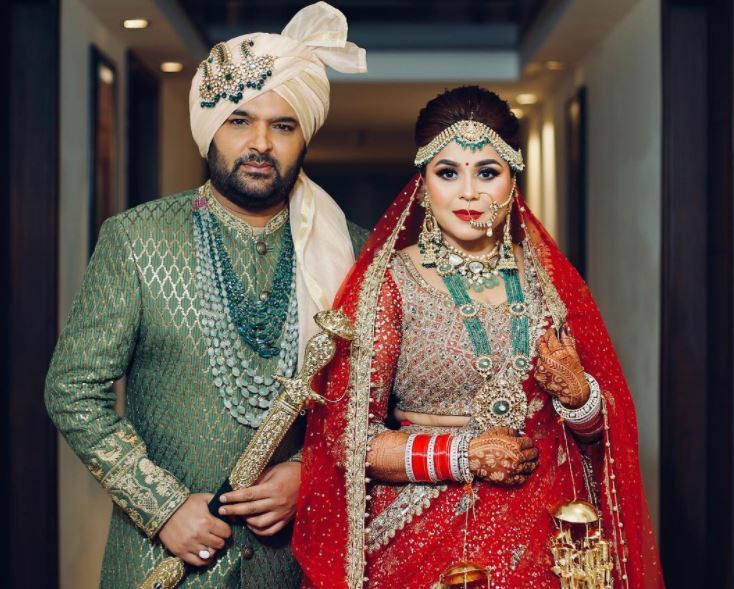 In the picture which shared by the Kapil Sharma, the bride was wearing a traditional red lehenga choli, the groom was decked up in a green Sherwani paired with an off-white turban. The wedding reception was organized in Amritsar which was attended by their respective families and close friends. Also, his co-stars Sumona Chakraborty, Krishna Abhishek and others were seen in the pre-wedding ceremonies. Kapil and Ginni are said to host a reception in Amritsar on December 14 and another one in Mumbai for industry friends on December 24.